Despite its moniker, an entrepreneur does anything but pop up on the day of a pop-up event. And organizing an event isn’t for the faint of heart. 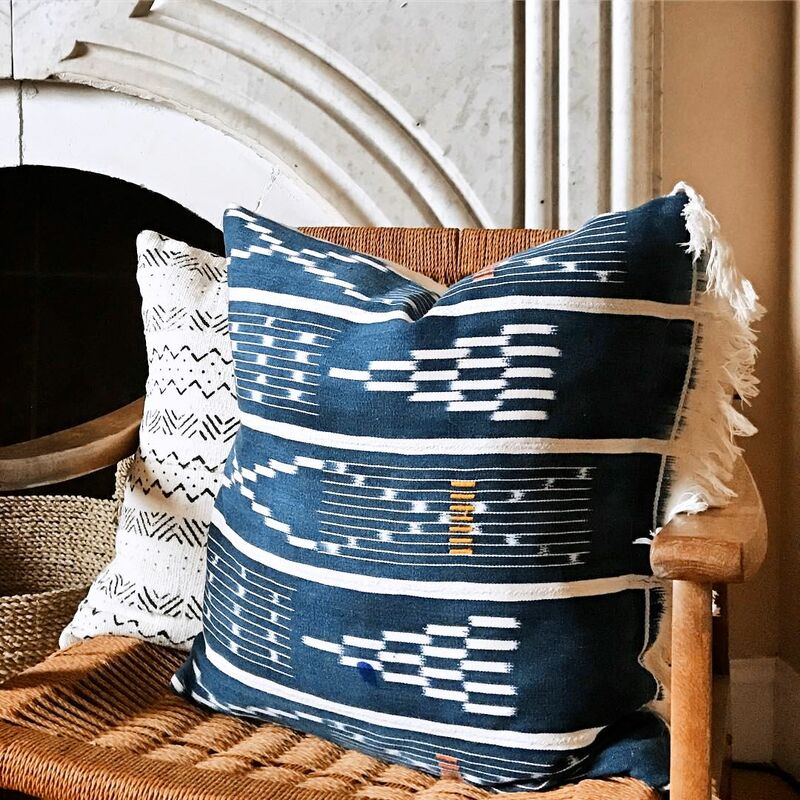 Ask Nasozi Kakembo - her home décor and lifestyle brand, xNasozi, launched in 2011 in Bedford-Stuyvesant, Brooklyn, and has been growing rapidly through a creative mix of in-person events, online sales, and wholesale partnerships. xNasozi creates beautiful products to adorn your store, home, and office, but the process of making can be emotionally and physically grueling. “I remember prepping for my first pop-up a few years ago, and I spent so many hours huddled over my sewing machine that I burned out, and was limping the next day,” she says. This taught Nasozi how to produce more efficiently, and the importance of having a team - even a small one. If you’re a new maker or young artist, you probably won’t host an exclusive pop-up tomorrow, but there are things you can do today to raise awareness about your brand and products. For starters, be active in your local community by connecting with neighborhood shop owners. It also helps to befriend other creatives, across various disciplines, because they can make observations about your work that you’ve never considered. Those connections can lead to surprising collaborations. A few years ago, Nasozi made sample napkins, but didn’t think twice about them because she never received an online order. Then, a friend asked Nasozi to make custom, reusable napkins for her boutique, and she saw them differently. “I started making napkins in various prints to take to markets and they always sold,” says Nasozi. “And, people repeatedly asked about them, so I recognized their demand.” Your customers will always let you know what they want, so it pays to communicate with them in-person and online. 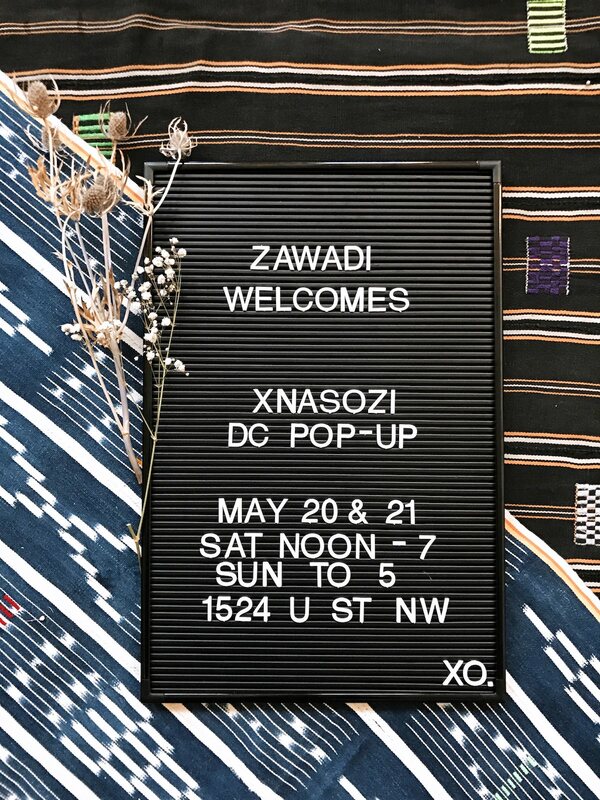 I chatted with Nasozi Kakembo and got a behind-the-scenes look at how she organized her pop-up at Zawadi. She also generously shared her top five tips for running your own successful pop-up event. 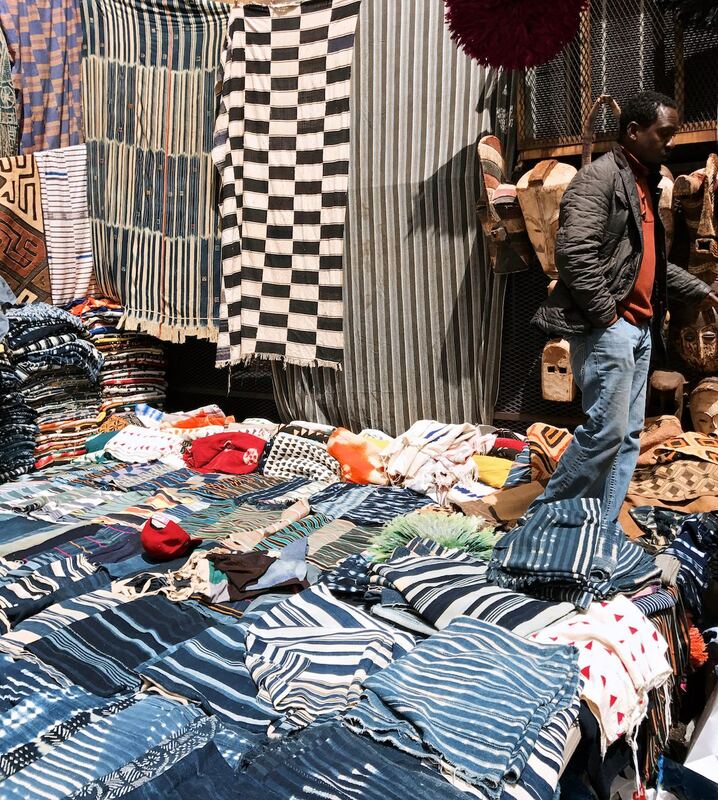 Nasozi Kakembo visits her primary vendor, Diop, at his flea market in Harlem, New York. There have been times when Diop didn’t have the fabric Nasozi needed, so she had to buy from a vendor in California who charged nearly double for the same pieces. “When you find a mudcloth design you need, buy all of it because you might not see it again!” she advises. 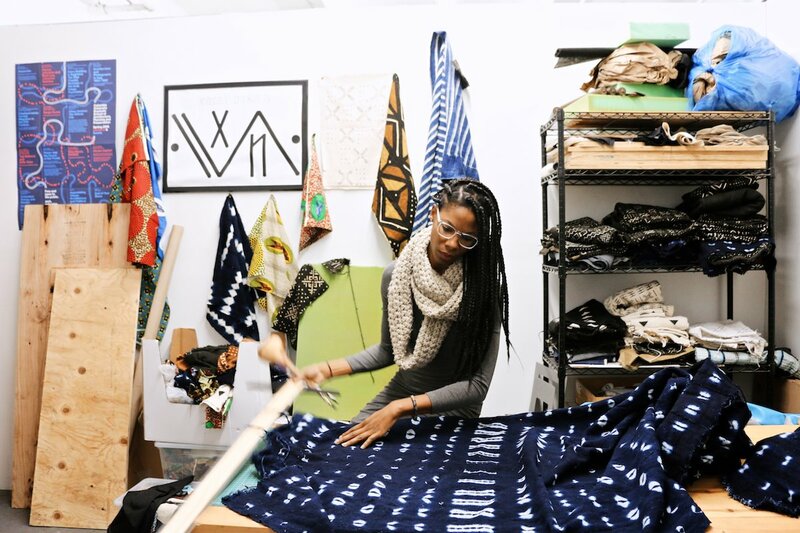 Nasozi Kakembo working in her Brooklyn studio. 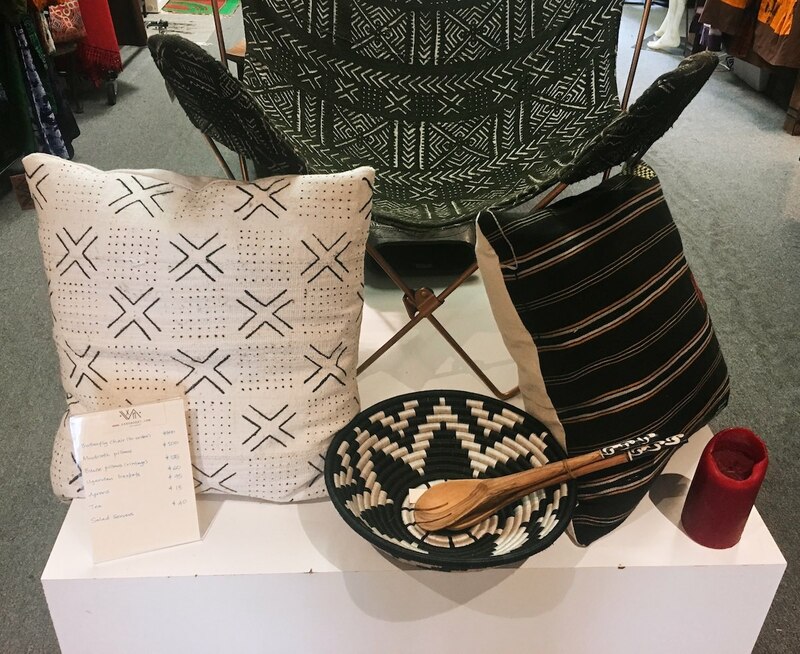 Before the pop-up at Zawadi, Whalen reviewed Nasozi’s catalog, and they discussed which products best complemented their existing stock. As a maker, she recommends being sure you have all the materials and fabric necessary in your studio before getting started, so you can take various factors into account - such as your availability and time it takes to produce different products - and confidently project your output. “The last time I visited Diop, I bought one-of-a kind, Ivorian textiles, and I knew I could only make six pillows from each piece of fabric. This dictated how many pillows I’d have for the pop-up,” says Nasozi. Limited edition, vintage Indigo Baule pillows with fringe made exclusively for the xNasozi pop-up at Zawadi. When you’re creating in your studio all day, oftentimes in solitude, it’s important to schedule breaks in outdoor and open spaces. In Brooklyn, one of Nasozi’s favorite places to recharge is Café Rue Dix, a family-owned and operated French and Senegalese café, restaurant, and bar. “It reminds me of being in Paris with the café chairs and floor-to-ceiling windows that fold open when the weather is nice,” she says. xNasozi butterfly chair elevated on pedestal at an exclusive pop-up. Physically plot how to use the retail space itself and its configurations to highlight your work. The morning of the pop-up should be reserved for getting your final items set and tagged. She recommends creating concept spaces to help buyers imagine how your products could work in their own home and spaces. Nasozi recommends defining your key marketing messages by highlighting how you authentically connect to space, place, and storyline. Run targeted Facebook ads concentrated on the radius around your pop-up to reach your local audience. It’s important to coordinate all social media posts to promote the event and exclusive products. And, especially if you’re not hosting a pop-up in your hometown, figure out what your customer base is like in that city, so you can speak to them directly. 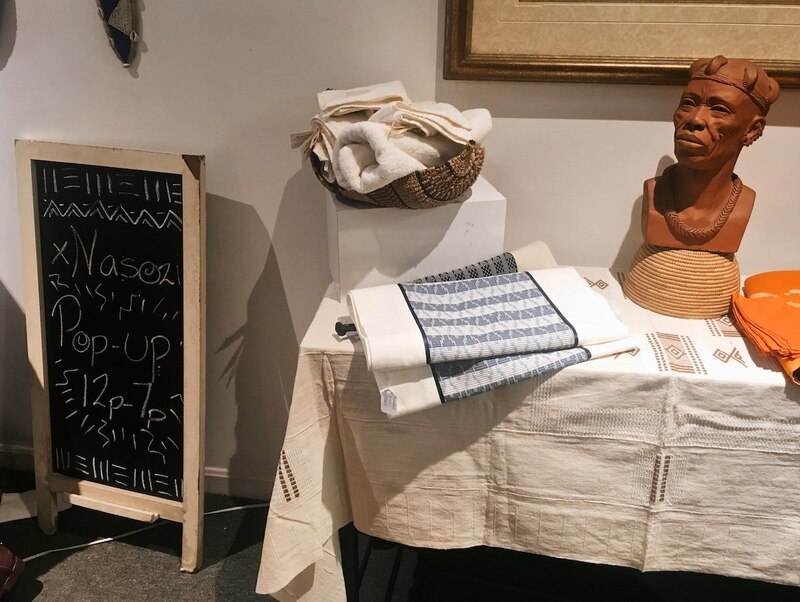 Marketing the pop-up at Zawadi was an interesting challenge for Nasozi, because her brand was born in Brooklyn and many of her products are Brooklyn-made. “I didn’t want to come across as this presumptuous Brooklyn maker colonizing D.C. because D.C. has its own creative vibe,” says Nasozi. “However, D.C. is my childhood home and I have crazy respect for Mrs. Irene, Zawadi, and the foundation she has built on U Street as one of the few, original establishments left standing.” It was critical to relay that respect through her marketing messages - she’s not just popping up in D.C., she has a personal investment in the success of the community. Jacqueline Lara helps entrepreneurs and artists share their stories and art. She creates content at Color Wheel Media and is a contributing arts and culture writer for 99U, i-D Magazine, and OkayAfrica. You can follow her on Twitter.